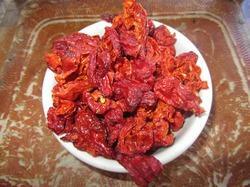 We are manufacturer and exporter of Bhut Zolakia( Ghost Chili ) Oleo resin. This Chili is world highest Pungent Chili. Which have about 20 million SHU or about 14% Capsaicin. We are the leading manufacturer and supplier of Bhut Jolokia Oleo Resin. Bhut Jolokia - also known as ghost pepper has been around many centuries and it is believed to have originated in assam, India. The word bhut, given from the bhutias people, means "ghost" and was probably given the name because of the way the heat sneaks up on the one who eats it. Its level of heat as almost double that of a red savina which was believed to be the world's hottest pepper. We are manufacturing bhut jolokia Oleo Resin and its heat value about 20 milian SHU. Packaging Details: 0.500 gm, 1 kg aluminium bottle. Looking for Ghost Chili Oleo Resin ?